Every now and then we are presented with a strip complete in a single package. So it was with Judge Dredd- The Trial courtesy of newcomer Stuart Catley. Coming Soon- Wirehead Rex- The Idolmaker Subterfuge. 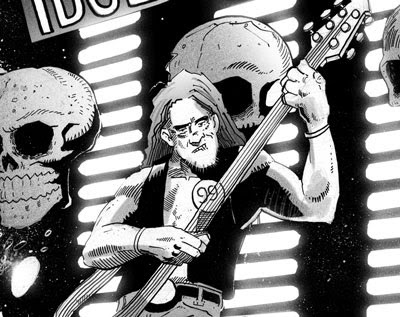 Following up on the Strip ‘The Day The Diddly Died’ from Dogbreath 28; writer Dirk Van Dom and artist Dan Cornwell return to bring us a second adventure for Wirehead /Rex! This time see Wirehead up to his pits (literally) in the seedy world of intergalactic talent shows! Coming soon: Strontium Dogs- Angel Of Death! Following on from THIS POST back in May I am proud to say that the latest solo strip for Flys-Eyes Wagner is ready for public consumption. Considering that this character dies pretty soon after being introduced this is the second time he has been in the pages of Dogbreath (He was also in DB17, courtesy of Eric Moore and Bruce McLaren). This time we have Alec Charles and Scott Twells on creative duties. 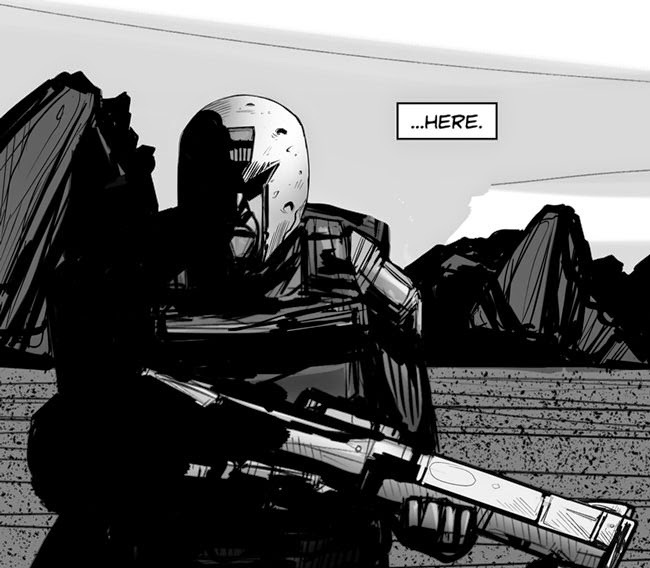 Starting our previews for the next crop of strips is Strontium Dog- Bloodhound by Andi Ewington and Matt Timson. This story is so good I’ve already asked for a cover to accompany it. When Dogbreath 29 is released in November you will see why for yourself. The summer convention for this year is the ICE event in Birmingham 2014. FQP will have a table for the entire event selling copies of all of the comics currently available, including FutureQuake, Something Wicked and the 2000 AD fanzines Zarjaz & Dogbreath. Editor Dave Evans will be there to critique art portfolios and considering the number of creatives to pass through the pages of FQP, this is an opportunity you won’t want to miss. Don’t forget- everyone who spends more than £10.00 can claim one of artist Bolt-01’s sketches, for more details talk to the man at the table- he’ll only be too happy to chat. Following on from the triumphant not-winning of the Best British B&W comic at the True Believers last month, you will have the opportunity to discover for yourself why FutureQuake has consistently placed in the top five nominees for the last 6 years. Paul Birch over at the Birmingham Mail has posted about the stories being weaved by JJ Robinson for FQ. From Second Chance by JJ Robinson; art by Alex Paterson. Available in FQ 24. From The Grimaldi, art also by Alex Paterson; available in FutureQuake 25.